Today’s installation of the Orbital ATK Cygnus resupply ship makes four spaceships attached to the International Space Station. 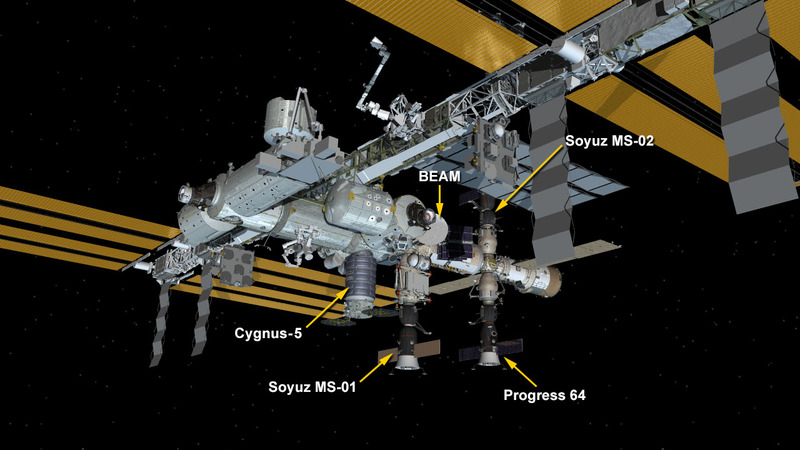 Orbital ATK’s Cygnus cargo spacecraft was berthed to the Unity module of the International Space Station at 10:53 a.m. EDT. The Expedition 49 crew will begin unloading approximately 5,000 pounds of science investigations, food and supplies when the hatch between the newly arrived spacecraft and the Unity module of the space station is opened. The spacecraft is scheduled to spend a little more than a month attached to the station. Orbital ATK’s Cygnus was launched on the company’s Antares rocket Monday, Oct 17, from the Mid-Atlantic Regional Spaceport Pad 0A at NASA’s Wallops Flight Facility in Virginia. Cygnus will remain attached to Unity until a planned departure in November sends the spacecraft toward a destructive re-entry in Earth’s atmosphere.